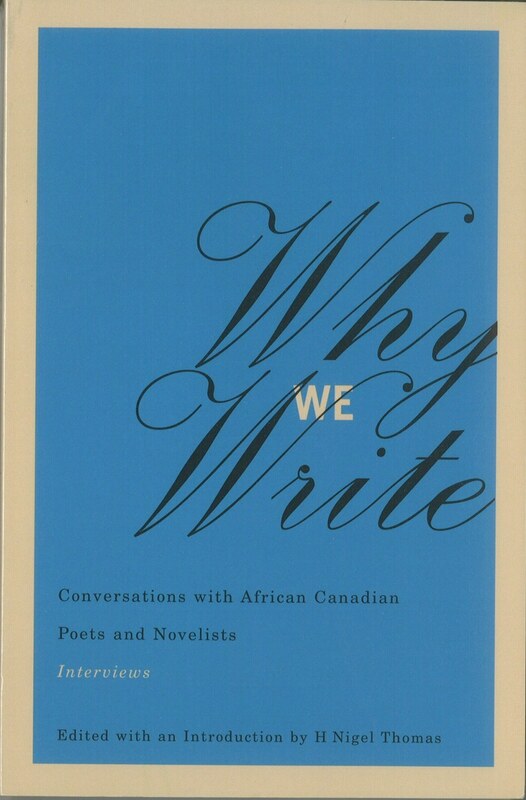 Indicatively, Why We Write is dedicated to three individuals—Harold Head, Ann Wallace, and Lorris Elliot—who usually aren’t the first to be invoked when African Canadian writing is discussed today, but who, as editor H. Nigel Thomas aptly observes, were “crucial in establishing a foundation for African Canadian literature.” Each of these individuals was active in the ’seventies and ’eighties, when Black Canadian writing was almost solely a small-press and “community-based” phenomenon, and each would appear to function as the inspiration for some discussion of developments since the early ’nineties, when a handful of Black authors began publishing with larger presses and attracting significant attention throughout Canada and, indeed, the world. 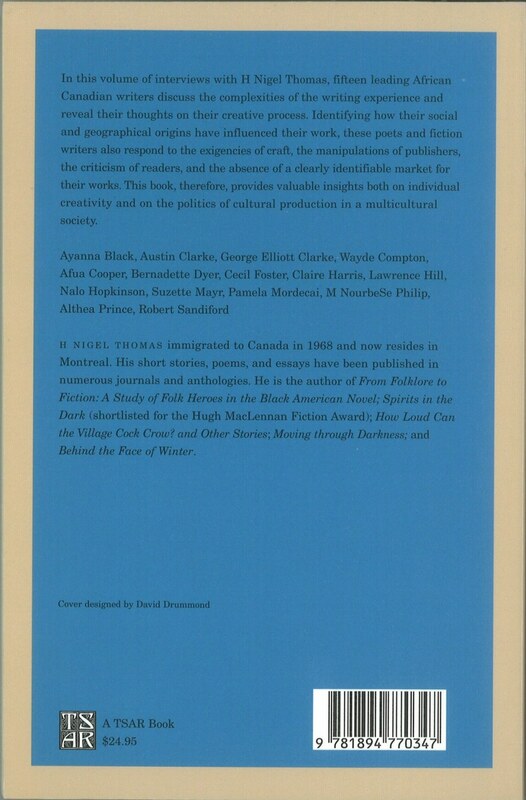 H. Nigel Thomas is himself a writer of significant accomplishment, and in his introduction entitled “Facing the Challenge,” as well as in his interviews, he highlights the uneasy relationship of Black Canadian writing to the broader print-culture market. Thomas interviews Ayanna Black, Austin Clarke, George Elliott Clarke, Wayde Compton, Afua Cooper, Bernadette Dyer, Cecil Foster, Claire Harris, Lawrence Hill, Nalo Hopkinson, Suzette Mayr, Pamela Mordecai, M. NourbeSe Philip, Althea Prince, and Robert Sandiford. There are moments of optimism, though. Wayde Compton, one of the youngest writers interviewed, joins his elders in voicing concern for the future of Black writing in Canada, but he also describes his profound sympathy for the British Columbia-based Black writers of the ’seventies “who self-published” and were overlooked because, in that particular time and place, “there [were] no readerships and reviews.” Recently, Compton co-founded Commodore Books, a small (if not micro) press dedicated to publishing Black Canadian literature—proving, of course, that there is now at least one active Black-focused press in English Canada. Evidently, things are still happening; and Thomas’ interviews do a lot to suggest why.